Anything happen in the WWE NXT universe over the past week? 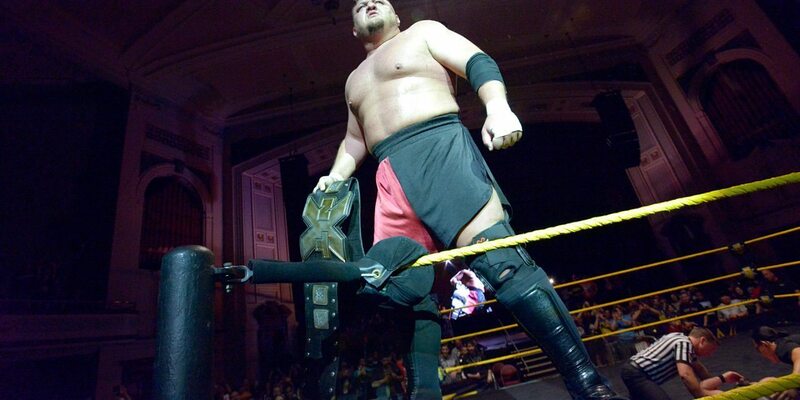 Oh, right, Samoa Joe won the NXT Championship at a Lowell, Massachusetts house show after losing in consecutive Takeover main events. Will a house show title change pop the gate knowing anything could happen? Maybe, but NXT is still selling out events well in advance and some of their venues are still holding fewer than 300 fans. Eva Marie is still Eva Marie, but at least she has a character. The best part of that character, however, is Corey Graves and his adamance that Phillips not speak during her entrance. The only thing that comes close is Phillips’ adamance that Eva Marie’s match on this episode is not a non-title match. As uninspiring as Eva Marie is in the ring, I was legitimately laughing throughout the match at the back and forth between Phillips and Graves. As you might expect, the match wasn’t much, and was mostly a vehicle for the newly-crowned champion to toy with an opponent. Nia Jax came to ringside, surely just to morally support Eva Marie, and somehow this match is going to stretch into a second segment. And somehow, someway, the match went another five-plus minutes after the commercial. Asuka eventually wins with a roundhouse kick. but Jax comes into the ring after the match for a face off with the champion. So NXT isn’t even going to put the full NXT title change on the WWE Network, which seems like a bad idea. Instead they showed a short recap package including the finish and Joe’s celebration. With the exception of a walk-and-talk promo, you’ve seen all of this on #WrestlingTwitter already. Meanwhile, WWE is already planting seeds…ask me on Twitter (@AlexWendland) if you want my Finn Balor debut ideas. The Revival is pissed off and it’s awesome. I don’t think either Trey Parker nor Matt Stone got any offense in. The Revival was brutal, badass and it made that incredible four-star tag team opener from Takeover: Dallas feel like it was last week – no small feat considering it was almost a month ago now. The former NXT Tag Team champions win with the Shatter Machine in short order. I gotta be honest, I had high hopes for the Dubstep Brothers when they surprised the Lucha Dragons over a year ago to win the NXT Tag Team Championships, and even higher hopes when they teamed with Alexa Bliss shortly thereafter. Well tonight, the listless, Bliss-less Blake and Murphy lost to Mojo Rawley. And Zack Ryder, but also Mojo Rawley. In like, five minutes. Asuka pawed at Eva Marie for about three times the length of this match. The Revival ran-in to attack the Hype Bros as they made their way up the ramp, however. A week or two against the Hype Bros would ignite The Revival from an on-fire team to a blazing inferno heading into a championship rematch against American Alpha. Even though this was six minutes, including entrances, it showed that Carmella has a long way to go before she’s ready to compete at the top of this division. Her fun little match with Bayley is the outlier in Carmella’s performances, not tonight’s match. Carmella has a bright future, but she’s pretty much right where she belongs in the NXT women’s division and would’ve been done a disservice by being moved to the main roster full time with Enzo and Big Cass. Shinsuke Nakamura is electric. Even in front of a tiny convention hall crowd just getting his spots in. I hope he’s teaching in Orlando in addition to wasting bumps in front of 275 people, because he’s a legitimate main eventer sitting in NXT. Every week I get to review one of his matches in this space is a wasted match for a hard-hitting 36-year-old with an injury history. Elias Samson got a chinlock and a clothesline of his own, but Nakamura got all his spots in quick and won with a Kinshasa. Every night with Nakamura is worth watching, but a series of month-old squash matches and lackluster coverage of the only major WWE NXT news since Takeover make this episode a head-scratcher. NextSTR #145: WWE Payback, NXT Lowell, Badd Blood 1997 & more! Who can we call Mr. SummerSlam? The Hot Tag: How Many Wrestling Podcasts Are Too Many Wrestling Podcasts?